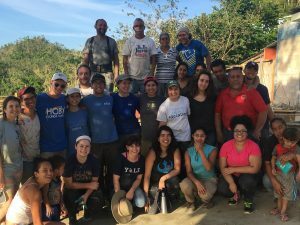 From raising money for local nonprofit organizations to participating in international service trips, fighting for social justice at Yale Hillel comprises a variety of forms. Specific programs include baking and selling challah through Challah for Hunger, volunteering at soup kitchens, promoting a greener and more sustainable Kosher Kitchen, and taking trips to local nursing homes. There are always ways to get involved in the New Haven community through Slifka Center! Social Justice programming at the Joseph Slifka Center for Jewish Student Life at Yale is grounded in and inspired by 1) the Kabbalistic vision of Tikkun Olam (a broken, holy world which requires human mending) 2) the righteous indignation of the Biblical prophets that we not neglect the oppressed, weak, or poor of our communities 3) the Biblical injunction “You shall not oppress a stranger, for you were strangers in the land of Egypt and 4) Rabbi Abraham Joshua Heschel’s belief that “In a free society, some are guilty, but all are responsible”. With these sources as inspiration and imperative, and understanding their requirements of us as essential to what it means to be a Jew, we seek to offer, enhance, and support meaningful service opportunities, and provide resources, guidance and learning opportunities for students and student organizations engaged in a wide variety of social justice work on in New Haven, across the country and around the world. Specifically, within a text-based social justice framework, we offer a wide variety of service opportunities and enhance existing campus programs by providing both Jewish context and financial support. This includes organized Alternative Spring Break service trips, student-initiated New Haven service programs, and support for existing Dwight Hall and Chaplain’s office New Haven service programs. Additionally, through the Social Justice program Slifka supports The Yale Farm, and look to partner with campus environmental initiatives, LGBTQ programs, fair-wage efforts and human rights activism (at home and abroad). In our teaching and learning about Social Justice, we will look at global and domestic economic disparities and other imbalances in our effort to understand the root causes of systemic injustice that may be confronted during the course of service-learning work, and much more. In our own building operations and environment we strive to embody the values we preach and teach, working to reduce our environmental ‘footprint’ in our dining operations and climate control, limiting the amount of waste we produce, and, above all, treating all the employees of the Slifka Center regardless of their position, age, gender, sexual orientation, religious affiliation, race or ethnicity, with dignity, consideration, and respect. Please see below for more detailed information about specific social justice programs at Slifka Center. Social justice programs at Slifka Center are generously supported by the Arthur L. Shapiro Social Justice Program Endowment and other generous alumni and parents committed to the Jewish values of Tzedek and Tikkun Olam. Email Social Justice Chair Dalia Moallem ’21 [email protected] with any questions. 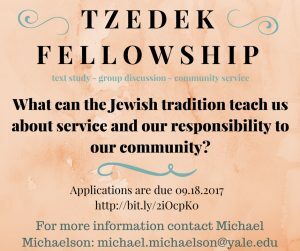 Each semester the Slifka Center awards Tzedek Fellowships for up to 20 students to support year-long commitment to dinner discussions and New Haven community service outings. For more information visit our Fellowships page. Slifka Center is partners with outside organizations to design meaningful alternative spring break trips.